NASA's Dawn spacecraft captured this amazing of Ceres in the asteroid belt, showing the dwarf planet's Occator Crater in false-color. Dawn arrived in orbit around Ceres in March 2015. The year that was 2015 swept in a significant amount of space and astronomy science. NASA's New Horizons probe reached Pluto after a decade of travel across interplanetary space, exploring the most well-known dwarf planet. But this wasn't the only great solar system story this year; Ceres, Mars and the moons of Saturn also revealed their secrets. Exoplanets abounded, and discoveries swept in from the far reaches of the universe. Pluto and its largest moon Charon as seen in natural color by NASA's New Horizons spacecraft during its historic July 2015 flyby of the dwarf planet. Even more amazing than the dwarf planet's famous heart, however, was the surprising fact that Pluto appeared to be geologically active, despite scientific predictions that the frigid world would have frozen into inactivity long ago. The Pluto images revealed a young surface with few impacts, indicating that the surface of the planet was reshaped by something — most likely ice — fairly recently in its history. The world boasts snakeskin-like terrain that bears no resemblance to the features of other worlds in the solar system. New Horizons allowed scientists to finally nail down the size of the planet. The probe also revealed a completely round world with no bulge at its equator, suggesting the planet has or recently had a subsurface ocean beneath its crust. Pluto's moon Charon revealed a few surprises of its own. Although not as young as its companion, Charon has a relatively young surface that seems to have undergone similar resurfacing processes. The northern pole boasts a strange reddish tint, most likely acquired from Pluto's captured atmosphere. While the moon has fewer mountains than its planet, one of them sits within a depression, forming a mountain in a moat. New Horizons won't finish beaming its Pluto flyby data to Earth until the summer of 2016. Scientists will continue to puzzle through the wealth of information to help them better understand the dwarf planet at the far reaches of the solar system. In the meantime, the spacecraft travels onward to encounter an object in the distant Kuiper Belt. Dark, narrow streaks on Martian slopes, like these at football field-length features at Hale Crater on Mars are signs of seasonal flows of liquid water. NASA scientists announced the discovery in September 2015. While signs of liquid water on Mars have been spotted over the years, cold temperatures and a thin atmosphere have blocked attempts to directly see such liquid. The September announcement of hydrated salts on the slopes of Mars strengthened the case for flowing water on the Red Planet. In 2011, scientists spotted strange features known as recurring slope lineae (RSL) on some of the slopes of Mars. The streaks appear during warm weather but vanish in cooler temperatures, leading some scientists to speculate that flowing water played a role in their formation. Scientists found hydrated salts, which form from liquid water, in regions where RSL lie, creating what the lead scientist called a "smoking gun" for flowing water. An artist's concept of the alien planet Kepler-452b, the first near-Earth-size alien planet to be discovered in the habitable zone of a sunlike star. NASA unveiled the exoplanet discovery on July 23, 2015. Other rocky worlds with similar sizes to the Earth have been found, but those orbited M-dwarfs, stars that are dimmer than the sun. Kepler-452b is the first Earth-size world found around a sunlike star in an orbit that would allow the planet to keep water at its surface. Pluto wasn't the only dwarf planet to receive a visitor. 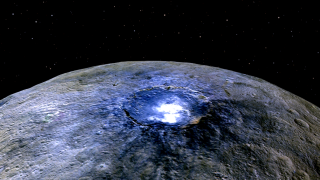 In March, NASA's Dawn mission visited Ceres, an icy world in the asteroid belt. Far from being just another rock, Ceres is an ice-covered world with bright spots that scientists think may be made of either ice or salts. These bright spots form patches of localized atmosphere on the dwarf planet. Ceres has only one mountain, which mission team members have dubbed "The Pyramid." The crag boasts a flat top and streaked sides, as though material is running down. Dawn will continue studying Ceres until June 2016. NASA astronaut Scott Kelly (left) and Russian cosmonaut Mikhail Kornienko began a yearlong mission to the International Space Station in March 2015. American astronaut Scott Kelly and Russian cosmonaut Mikhail Kornienko reached the halfway point of their yearlong mission on board the International Space Station in September, one of the longest astronaut trips to date. Health studies on the mission will help doctors better understand the effects of extended space travel on the body. If Kelly remains until March 3, 2016, his trip will be the longest taken by a NASA astronaut. A rare supermoon total lunar eclipse wowed sky-gazers around the world on Sept. 27, 2015. Case in point, this amazing photo by Victor Rogus from Manatee County in Florida. A rare supermoon lunar eclipse in September delighted skygazers around the world. Although eclipses occur frequently, this year's treat occurred while the moon appeared slightly larger in the sky than usual. Only five supermoon eclipses occurred in the 20th century. The next one won't occur until 2033. Saturn's moon Enceladus startled scientists when NASA's Cassini mission revealed geysers bursting from the moon's southern pole in 2005. After almost 10 years, scientists confirmed that the source of the water was not a local pool beneath the pole but rather a global ocean on Enceladus, which somehow managed to stay liquid over the 4.5-billion-year life of the solar system. Tidal interactions with Saturn are the most likely explanation. A past Cassini flyby revealed the presence of hydrothermal activity within that ocean, making Enceladus a prime candidate for a site where life evolved beyond Earth. This and other discoveries have lead to discussion about a mission to this Saturn moon. In 2015, NASA's Hubble Space Telescope celebrated its 25th year in space. To celebrate, NASA unveiled this view of the star cluster Westerlund 2 and gas cloud Gum 29. In April, NASA's Hubble Space Telescope celebrated the 25th anniversary of its 1990 launch. The mission, which initially suffered from blurred vision due to a problem with its mirror at launch, has gone on to capture the public's imagination, with its incredible pictures of distant astronomical events and features, and of worlds within the solar system. The mission is slated to continue until at least 2020. In August, scientists announced that the galaxy EGSY8p7 was the most distant ever seen at a range of 13.2 billion light-years from Earth. A galaxy from the first 600 million years after the Big Bang was spotted in August, the most distant galaxy observed to date. EGSY8p7 lies about 13.2 billion light-years from Earth. Because of the correlation between space and time, scientists are able to observe the galaxy as it appeared 600 million years ago. Further studies will allow researchers to better understand how the universe evolved in its youth. When the Hollywood blockbuster "The Martian" hit theaters in October, the film industry wasn't the only group to promote the picture. NASA worked with the movie as a way to garner support for its own Mars exploration plans, which aim to send astronauts to the Red Planet in the 2030s. In the movie, an isolated astronaut struggles with stretching food, water and oxygen supplies to survive on the Red Planet until he can be rescued. Mars colonies of the future will face similar survival needs, though hopefully without the same urgency. Both the movie and the Andy Weir novel it was based on were heralded for the attention to scientific detail shown by the writers.